1. Loulos Beach The beach is just one kilometer away from the famous beach of Mykonos, Kalo Livadi. You can get there by foot from Kalo Livadi, and by car from any point of the island. From the main road that you can park, you will see a small gravel lane, follow this! Loulos is a small beach with white pebbles, calm waters and characteristic blue-green color. Moving to the north of the island. After you pass the artificial lake of Mykonos with herons and other migratory birds, following the road to the sea, you need to go a few kilometers of dirt road to reach Fokos. The golden sand, the little pebbles and clear waters will fascinate you. There, you will find Fokos tavern, were you can enjoy some delicious traditional Greek meals. Mirsini or otherwise Mersini is located just 500 meters away from the beach of Fokos and is completely isolated. Get ready for a beautiful sandy beach with green water in which there will be only you and your friends. Conquered Myrsini? Time for a private a la carte swim in it's crystal clear waters! As you take the road to Profitis Ilias, turn left to Merhia. The access is not very easy so this beach will generously give you all the tranquility you seek with deep blue waters creating a splendid creek with only few houses around. 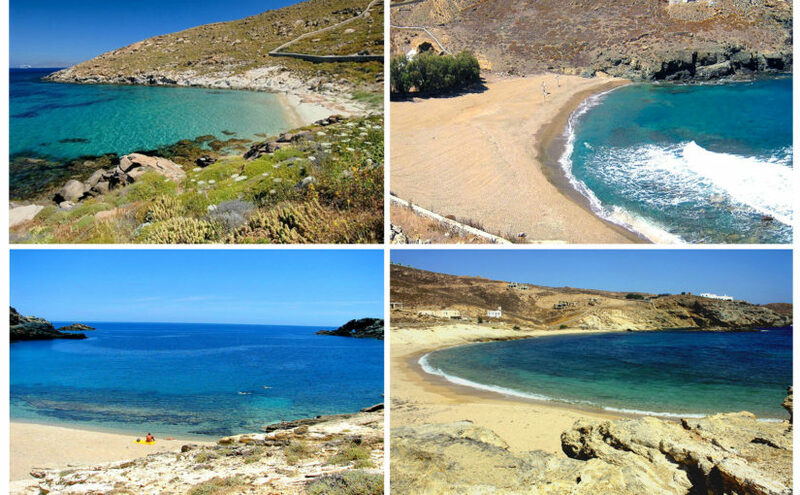 Kapari is a beautiful and remote beach on the western side of Mykonos. It was once a common secret between the local residents of the island. Nowadays many visitors ask to visit Kapari, yet it remains a tranquil place, that forces you to appreciate amazing susets! The sun sets over the sacred island of Delos, creating a color palet with no mach. To find Kapari, head for Saint John beach and then find a smiley face to just ask!